KIGALI, Rwanda – Facing scrutiny over links to Saudi Arabia, FIFA says new competitions that will bring in $25 billion will not be funded directly by any nation, according to documents seen by The Associated Press. FIFA Council members received the funding commitment in briefing notes sent ahead of a meeting Friday in Kigali, where President Gianni Infantino will seek their support for new tournaments. The documents were shared with the AP on condition of anonymity because they were meant to be kept private. “FIFA would not enter into a joint venture for this purpose, whether directly or indirectly, with sovereign wealth funds of individual states,” the documents state. The documents do not say anything about investment from private entities linked to nation states. Japanese conglomerate SoftBank Group Corp., which is part of the group seeking a joint venture with FIFA to sell the rights to the new competitions, has received $45 billion from Saudi Arabia’s sovereign wealth fund for technology investments. Infantino’s meetings with King Salman and Crown Prince Mohammed bin Salman of Saudi Arabia in the last year raised questions about the kingdom’s involvement in the overhaul of international soccer competitions for national teams and clubs. Seven months after Infantino offered limited details of the financial proposition, FIFA council members have been told of principles that will be “fully adhered to in any potential future agreement” with investors in the Club World Cup and worldwide Nations League. Investments with Saudi Arabia have become increasingly problematic for organizations since Saudi officials have been accused of killing of Saudi writer Jamal Khashoggi at their Istanbul consulate on Oct. 2, circumstances that are still disputed and have caused a global uproar. Many top Western executives and officials withdrew from an investment conference this week that is the brainchild of the crown prince, who oversees the sovereign wealth fund. By explicitly disassociating itself from such state backing in the document to council members, FIFA is distancing itself from Infantino’s comment when asked at a media briefing in June whether the Saudis were backers of the project. “Whoever invests in sport generally I think is welcome provided we do the things in an appropriate way,” Infantino said. The proposals, which Infantino hoped to have approved by May, have stalled because of opposition within the council to Infantino’s secrecy over the financial backers. “Football is not for sale,” UEFA president Aleksander Ceferin, who is also a FIFA vice president, said in May. UEFA is opposed to the new Club World Cup proposal. FIFA attempted to alleviate council members’ concerns. “FIFA as an organization would not benefit financially from these competitions as all net revenues for football would be distributed, in particular to member associations,” the documents say. Infantino has had to adopt a new strategy to reboot plans for the overhauled competitions to replace the existing annual seven-team Club World Cup and the Confederations Cup, which both lack appeal with fans and broadcasters. 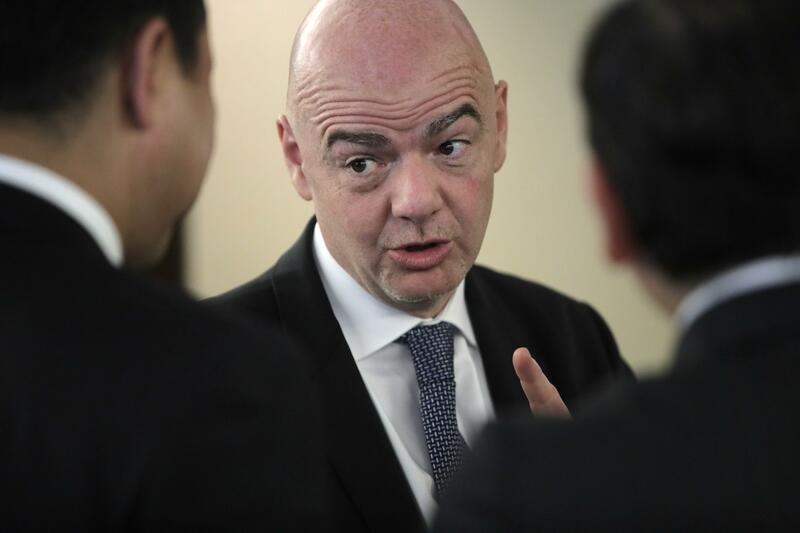 When the FIFA Council meets Friday, Infantino wants backing in principle from members that he can push ahead with plans to a global Nations League, which expands on version created in Europe, and the bigger Club World Cup. Infantino won’t ask members to endorse any financial strategy or precise formats at this stage, according to the documents. There are two options for a new Club World Cup in 2021 that council members will be asked to choose between. The first would see a tournament staged every four years over a maximum of 18 days in the June slot currently used by the Confederations Cup, which serves as the warm-up event a year before the World Cup. FIFA earlier this year proposed 24 teams but it now leaving that competition field open. The second proposal, which has only just been revealed by FIFA to council members, would keep an annual Club World Cup but shift it from December to the July-August window currently used by European teams for often-lucrative preseason friendlies in the United States and Asia. If either proposal is backed by the council, the FIFA administration would then be tasked with finalizing suggestions for the number of teams and slots per regional confederation before the next scheduled meeting of the FIFA council in March 2019. The Nations League was first conceived by UEFA when Infantino was general secretary of European soccer’s governing body before being elected FIFA head in 2016. It debuted in Europe last month when qualifying for a CONCACAF version began. Infantino wants the format to involve all six confederations with eight-team finals serving as mini World Cups every two years. The council will be asked to “decide whether or not it falls under FIFA’s responsibility to organize and commercialize such a competition.” If it does, the FIFA administration will consult further with soccer leaders with the hope of securing approval at the next meeting for the global Nations League to begin from 2020-21. Published: Oct. 24, 2018, 2:32 p.m. Updated: Oct. 24, 2018, 2:35 p.m.